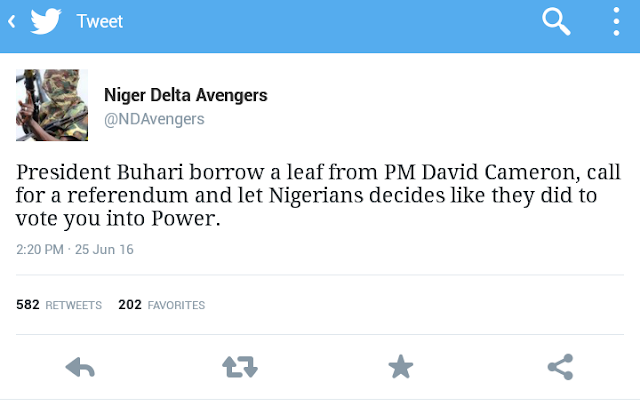 The Avengers has called on dictator Muhammadu Buhari to take a cue from PM David Cameron, by calling for a referendum so as to determine the readiness of various region to secede from the false marriage conjured by the British. The group which listed Self determination and the release of Nnamdi Kanu as part of their conditions for a cease fire, released a statement to that effect. "President Buhari borrow a leaf from PM David Cameron, call for a referendum and let Nigerians decides like they did to vote you into Power. The World should Take note on how peaceful it was for Britain to vote not to be part of EU. 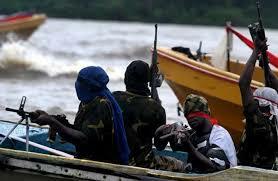 Why Can't the International community ask Buhari to do same." This statement came after an earlier one made by the group on the 21st June, 2016, where they commiserated with their cousins-IPOB for their loss on the 30th may, 2016, after the bloody massacre of armless Biafrans by the murderous Nigerian army. Muhammadu Buhari should swallow his pride and show same gesture he showed the Palestines and Western Sahara, by allowing Biafrans to exercise that same right to self determimation and freedom from blockade.